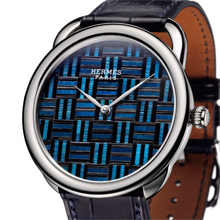 Hand craftsmanship lies at the core of the aesthetic cultivated by the House of Hermès. A range of precious skills are constantly celebrated, and the objects created tell the story of the ties between hand and mind. This workmanship naturally involves leather, since Hermès has been a saddlemaker since 1837, but also silk, crystal and silver. All materials, even those of humble origins, thus find scope for full, noble and hand-crafted expression. Today, the rye straw used in these models is produced by only one farm in France. Longer and less knotty than its standard counterpart, it is hand reaped to ensure optimal selection of the usable parts. Mass-coloured on the spot and then laid out flat to dry, the straw which is subjected to weather conditions, variations in humidity and various baths, never displays the exact same shades of colours. 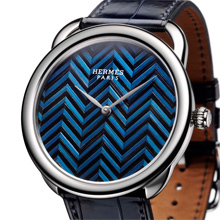 Its natural colours subtly illuminate the marquetry motifs. Split open with a thin blade and then manually flattened with a bone tool, the wisps are then cut up into various lengths. This calls for accurate gestures and considerable physical strength. Playing with the colours and the directions of the various wisps, the artisan assembles his motifs on a sheet of graph paper. 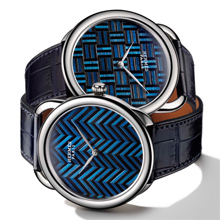 Glued in much the same way as a leather book binding, the straw marquetry motif is then assembled on the watch dial.